Uważany za pierwszy na świecie czołg podstawowy. Klockowy model szybkiego czołgu produkcji brytyjskiej z okresu II wojny światowej. Gruby pancerz silnie pochylony był bardzo dużą zaletą czołgu. Przede wszystkim utrudniał on uszkodzenia pojazdu przez pociski. W pracach konstruktorskich nad czołgiem brał udział polski inżynier Tadeusz Marek, który w późniejszym okresie pracował dla Astona Martina. Zestaw zawiera aż 610 elementów w tym jedną figurkę żołnierza wyposażonego w brytyjski ręczny karabin maszynowy Bren. One more thing: The sticker set that has come with my Centurion I kit does not have the red+white flags shown on the tank on the package photograph. Please write an e-mail to office@cobi.pl with this information and we'll try to help. 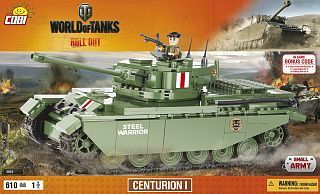 Hello, last week and today I had e-mailed you about wrong parts contained in the COBI World of Tanks Centurion I set I had purchased. That set contains 2x2 axis parts the shaft of which is too short to hold 2 road wheels. You can only put one road wheel on them. From my KV-2 set I had similar 2x2 axis parts with longer shaft. So I need the correct 2x2 axis parts from you (6 pieces). I can send a photograph showing the wrong and the correct part if needed. Please contact me for my postal address. I also tried to register with COBI, but everything I enter in the registration form's "login" field is rejected as containing invalid characters. Your message was answered to in another e-mail. A great model. I have by now built 18 Cobi Small Army models and this is one of my favorites. 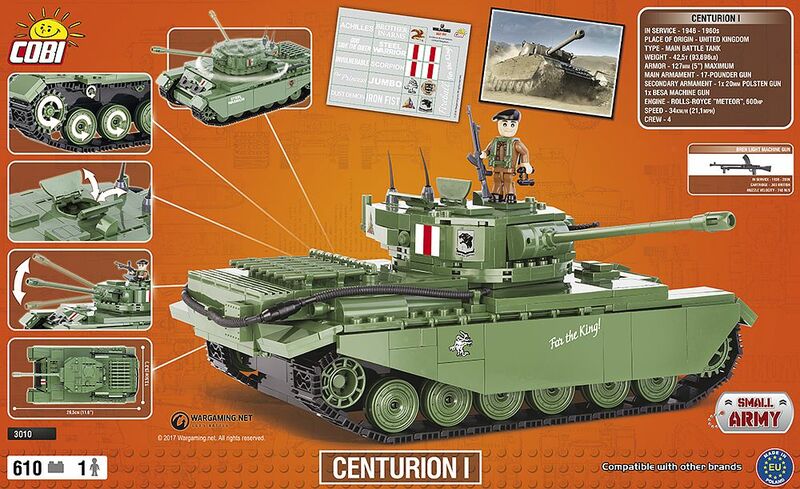 I have always liked the Centurion and this model really captures the tank quite well. I am not a fan of the decal stickers that come with the World of Tanks series and would prefer printed blocks and historically acurate markings like in the WWII series. But otherwise a great model. 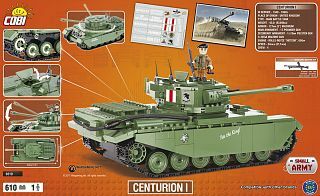 I am hoping Cobi will one day bring out a later Model Centurion (Mk 5/2 and up) with the L7 gun. And then hopefully with historically acurate decals printed on the blocks. We appreciate your opinions and reviews and will give your suggestions to the right department.